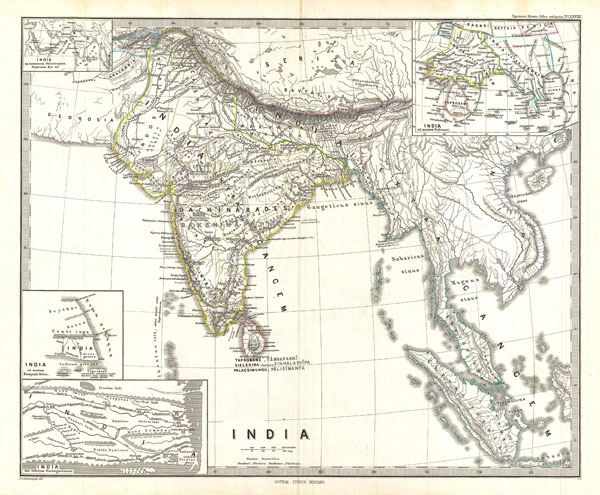 This is Karl von Spruner's 1865 map of India and Southeast Asia in antiquity. This map covers the entire subcontinent as well as Southeast Asia, Sumatra, and Ceylon. In addition to the main map, there are five insets. The upper left inset offers a general view of the region from Arabia to Sumatra including the Indian Ocean. The lower left inset maps reveal India as it was depicted in antiquity by the Alexandrian cartographer Ptolemy and in the ancient Roman map known as the Peutinger Table. The upper right hand map is an early Renaissance take on Ptolemy in which India has been reduced and Taprobane, or Ceylon, is increased to vast proportions. In general this map labels important cities, rivers, mountain ranges and some other topographical details. Territories and countries outlined in color. The whole is rendered in finely engraved detail exhibiting throughout the fine craftsmanship of the Perthes firm. Rumsey 1626.029. Phillips (atlases) 3288. Espenhorst, J., Petermann's Planet, p. 397-404. Espenhorst, J., Andree, Stieler, Meyer & Co., p. 148.